More than 80 performances round out the 10-week festival. (Inset top right) Bela Fleck; (Inset bottom right) R.E.M.’s Mike Mills. For the past 82 years, thousands of people have flocked to the Brevard Music Center’s summer music festival. This season promises a combination of fresh sounds and cherished favorites that keep audiences coming back for more. “We’re looking forward to a broad and varied program of concerts this season featuring world-renowned artists and great gems of the orchestral repertoire,” says Jason Posnock, BMC’s Director of Artistic Planning and Educational Programs. 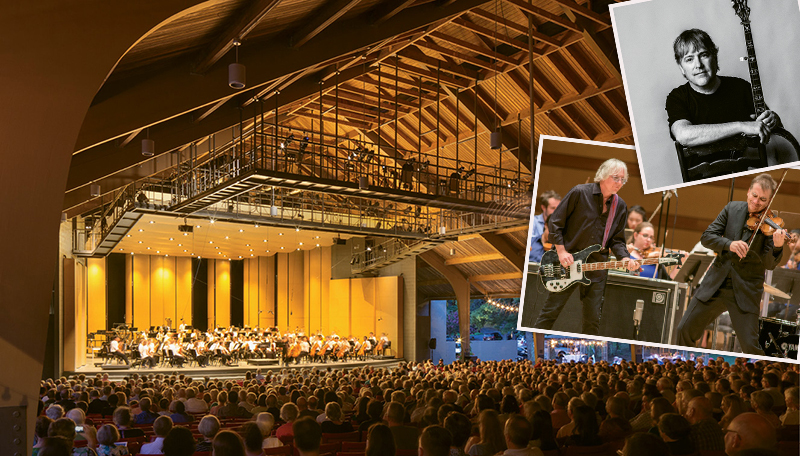 In addition to spectacular classical performances, the season also features concerts by five Grammy Award-winning artists, including R.E.M.’s Mike Mills (July 7) and banjo master Béla Fleck (August 18). Posnock says the rock, bluegrass, and jazz concerts “give us a chance to reach out and welcome new audiences.” They’re also a way for classical music lovers to explore new genres, proving there’s something for everyone at this sublime musical jubilee.